James Clapper, the US Director of National Intelligence, controversially told Congress on Thursday that "over the longer term ... the [Libyan] regime will prevail". His comments provoked a furore, even prompting the White House to insist that the president did not agree. But despite a renewed sense of momentum for the regime, Mr Clapper is probably wrong. Over the past few days, Col Gaddafi's forces have taken Zawiya and Ras Lanuf. The regime continues to enjoy a flow of oil export revenues. The UN Security Council, NATO, and Arab states are mired in indecision about the legality, legitimacy, and necessity of a no-fly zone, let alone further military action. And it is clear that the rebels do not enjoy the full-throated support of swathes of the defected army, with many thousands of troops in the east still uncommitted. The rebels' vision of a relentless push westwards, linking up with liberated western cities to march on Tripoli, has been extinguished. The rebels, then, cannot prevail in the foreseeable future. The core security forces commanded by the regime remain intensely loyal and well-armed, so a coup is equally unlikely. But this counter-offensive should not obscure the fact that Col Gaddafi's political future will be an unhappy one. In the unlikely event that the opposition bastion of Benghazi collapses, Col Gaddafi would struggle to administer the city or its surroundings in the face of intense guerrilla warfare. Though Libya lacks the mountainous terrain conducive to insurgencies, the urban warfare seen in Zawiya is indicative of the grave cost that would be imposed on any occupying force. Sporadic acts of sabotage against oil refineries would hit the regime's treasury, and currently ambivalent army units in the east - such as the 2,000 defectors loyal to Major Ahmed Qetrani - might be provoked into mobilising. Col Gaddafi's intelligence services lack extensive human sources in the east, and would struggle to extirpate an urban insurgency that would wear down the morale of conscript forces and divert large numbers of personnel from other restive areas. The Libyan leader would also face international isolation, a reversion to his pariah status of the 1980s and 1990s, and crippling sanctions. Oil export revenues, trade, and engagement would be permanently curbed. Even Russia has frozen arms sales to Libya. Libyan diplomats and officials, having enjoyed eight years of rehabilitation into the international community, will chafe under this pressure, and may gradually transform into focal points for resistance within the regime. This strangulation of funds and firepower will not be decisive in itself, but it will render the rebel-regime balance somewhat less lop-sided. These measures are likely to be ratcheted upwards, particularly as foreign powers are eager to avoid a military intervention. Assistance to the rebels may well have begun, and it is likely to increase over time as foreign intelligence agencies and militaries - particularly those from Britain, France, and the United States - develop ties to trusted members of the opposition. Both the Arab League and the Gulf Co-operation Council have swung against Col Gaddafi, and even the African Union - a club welcoming to dictators - is hardly supportive after years of suffering Col Gaddafi's pan-African posturing. Is a no-fly zone possible? This is why it is mistaken to conclude that Col Gaddafi "will prevail". What is far more likely than a regime victory is a protracted struggle, much as Saddam Hussein ruled over a rump Iraqi state in the dozen years after 1991. Faced with no-fly zones across much of his territory, Saddam inflicted enormous damage on Shia communities in the south but remained hemmed in. But this sort of de facto partition is less of a stable equilibrium in Libya than it was in Iraq. 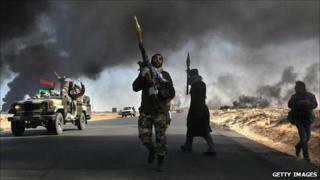 Libya's rebels are in a better position than Iraq's. Libya's second-largest state-owned oil company, the Arabian Gulf Oil Company, has announced plans to use oil sales to fund the opposition. And while its facilities are weakened by the exodus of foreign expertise and remain vulnerable to aerial attack by the government, Col Gaddafi will be self-deterred from ramping up airstrikes for fear of tipping the debate on a no-fly zone in favour of would-be interveners. Moreover, the military balance is fluid - there is every chance of rebels retaking Ras Lanuf. And though other countries are unlikely to follow France in recognising the self-declared National Council, its engagement with Western states will certainly deepen, furnishing it with legitimacy and probably funds. We should be wary of concluding that, just because Gaddafi is doomed to a tenuous grip on Libya, the rebels have any better chance of attaining their goals through military struggle. Between 1960 and 1999, civil wars stretched on average to over seven years. Libya's has not yet lasted a month. Shashank Joshi is an Associate Fellow at the Royal United Services Institute (RUSI), a defence think-tank in London, and a doctoral student of international relations at Harvard University.